"Did you make that belt?" This belt? The one that matches my bag? It was so easy, too - just little D-rings, but it was fun. Next up, one for Princess - she wants one like mine (and she is constantly having to tug at her pants). 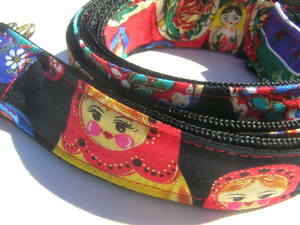 I like how the matroshka fabric looks cut thin like this. 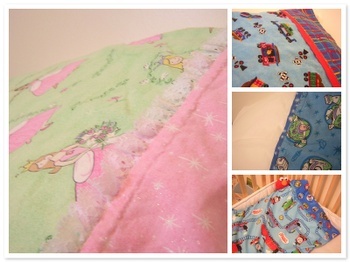 I love seeing how fabric looks cut up - I think it's one of the things I like about quilting. Somehow, seeing fabric cut (cropped, I guess) makes it look very different. 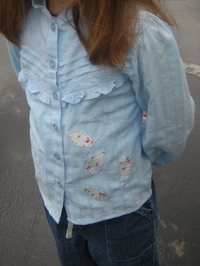 Princess is wearing a fabulous shirt (clearance - $3.00) that I added some little leaves and a vine to. Monkey's shirt has an 'L' for his real name - and chocolate drips, because apparently Monkey thought the shirt needed more embellishing. 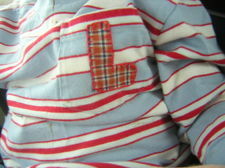 The L is made from one of his dad's old shirts - which is kind of cool. 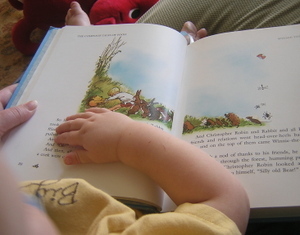 So, did you know that it's Banned Books Week? Go to your library and read some! The American Library Association has some good information (and lists) on their website. For a more serious angle - check out Amnesty International's take on it. Did you know that The Giver and Bridge to Terabithia are on some of the lists? That J.K. Rowling is one of the top ten challenged authors? What is your favorite challenged book? So, speaking of books, I am in the middle of several - and I just have to encourage you to check out The Portable Dorothy Parker (link on my sidebar. It's not a banned book, but I love it. It's a collection of short stories, poems, and letters by the witty writer Dorothy Parker. Very fun. 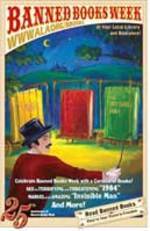 Her short stories are entertaining glimpses into early 20th Century relationships. I highly recommend it. 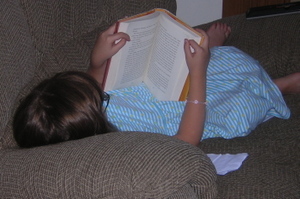 We find Princess here a lot - snuggled up in the big chair with a book - gotta love it! She's been reading this book - and today I overheard her acting out Romeo and Juliet with Barbies. "Stay by my side, Romeo." Hee Hee! So, I got the bias tape on last night - finally. I ended up sewing the seam first, and then sewing the tape on top - which is probably what you're supposed to do, I realized later. Silly me! 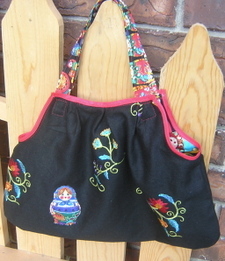 I saw this bag pattern on Tasha's blog and she was so sweet and sent me the pattern - Mahalo, Tasha! Learning from what she didn't like about hers, I opted for a thicker handle. The black fabric is a looser-weave fabric (part of the bias tape problem), and I appliqued a doll on each side. I made a mistake with the lining - I cut it out with all the dolls facing the side, instead of up, but in a combination of laziness and loving the fabric too much to waste it, I just let it go. I'm liking the fabric/combo - very Russian Winter. It will be fun for the Holidays, I think! I am glad that I made this for myself, though, as it turned out cute - but very not perfect. Maybe the next one will be better - I think it would be great out of light, spring fabrics, too. My husband's comment? Stuff's going to fall out of there. I had somewhere to go on Saturday, and I realized that I don't have a small bag. You know, one that isn't big enough for at least 2 diapers, wipes, and snacks. So, we were totally busy, but of course I get this crazy urge to make myself a little bag. Thanks go to my wonderful husband for putting up with that, BTW. I've been wanting to make this pattern, and I bought some of the cute matroshka fabric I've been eyeing - so it seemed like a good combination. It was going surprisingly well... until I hit the bias tape. I've never used it before, and I won't be in a hurry to again, let me tell you! I think the one I chose is narrow, so maybe it's trickier? Or I'm just not good at it? 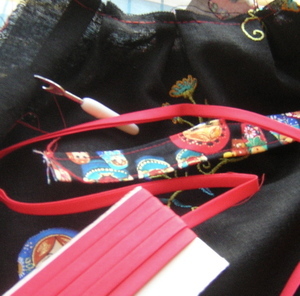 So, I'm forming an alternate plan, and will hopefully have a finished (and hopefully cute) bag to show you tomorrow. That's right, folks, I'm a traveler! I found this online - probably linked from someone's blog (sorry I forgot who). I started checking away at the boxes, and then I realized I didn't remember some of them. While I was at my parents' house recently I asked them for help - we even consulted a handy road map for help. Turns out I've been in all but 4 states! So one of these days I'll have to head over to Alaska, North Dakota, Michigan, and South Carolina. I grew up in a military family - I think I've driven cross-country at least 6 times. I've lived in 8 states and visited many more. It was a great way to grow up. Talking to my dad about this was fun - he's almost been in every state twice! He told me about the time when our family drove from Boston to Seattle the week before Christmas. Record low temps the whole week - we got stuck somewhere because our car wouldn't start (it was -42 F apparently!). Us kids (I was 7, and the oldest of 3 at the time) were in our winter coats in the car - we had other car problems (sounds like fun, eh?) - but we made it to Seattle (where it was only -11 F) in time for Christmas (and in time for Santa to bring me my Cabbage Patch Kid doll - a magical year!). How many states (or countries, or provinces, or continents - like Meemo) have you been in? Look what Mr. Postman brought me yesterday! I have to admit I was so excited that this package might be coming that I was peeking out the window - and when I saw a little box being shoved into my mailbox I ran out to get it. There were earrings - and this gorgeous necklace - some fabric, buttons and all kinds of stuff. Lucky Me! 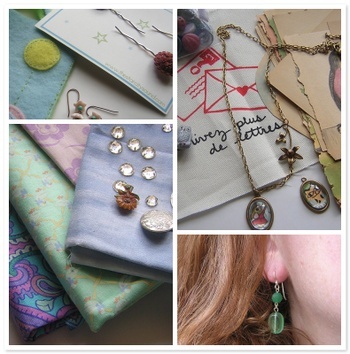 Sarah is seriously amazing - you MUST go check out the jewelry in her shop! Princess was helping me open the package (she LOVED the buttons, BTW) and she said "You are one lucky mom." Yes, I am. Today I got my postcard from Carly for Morphe II - all the way from Australia. Carly even drew a little moopy on it! I love mail. I do. So, on a completely unrelated tangent: has anyone ever gotten the playmobil or lego advent calendars for Christmastime? I would like to get one of them for the kids - leaning towards the lego one (the kids are WAY into legos right now) - but we're thinking of introducing the playmobil thing this Christmas (maybe this?). Any opinions? So, my Princess says to me today "Mom, I want 2 things for Christmas, and they both start with 'P'." Guess what they are - Pony and Puppy. .......Ummmm, sorry, kiddo! We just don't do animals. (And a pony - I mean, c'mon!) She just rode a horse for the first time at her friend's grandparents' house last weekend. Honestly, I thought she'd chicken out, but she loved it. "How about a doll bed?" I say - because that's what she's been talking about before today - and because I already got this at a yard sale - so so cute (and with all the bedding). 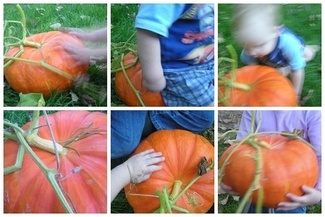 I posted some pictures on flickr of my kids' rooms - for the Go To Your Room group - a fun one. Anyway, if you're curious - I think they're cute - but you have to have a high Girly-Room Tolerance! 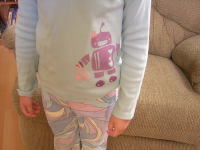 Princess said "Oh, I love it ... and I think I need robot pants." Fall weather, anyway! We went from a high of 85 degrees to a high of 53 - this past week! So finally I'm feeling a litte fall-ish. **Updated - look at the view of the mountain this evening - that's snow at the top! Snow! I went through Monkey's winter clothes and decided that stripey shirts are boring. 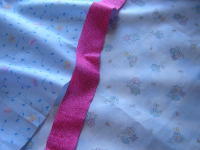 I now have a stack of shirts to embellish - I think they'll make a good project to work on during Thomas' dance class. I am also going to stencil a few. 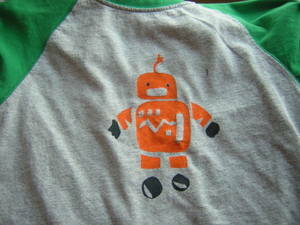 Here's one I did this weekend for Thomas - on a thrifted shirt. 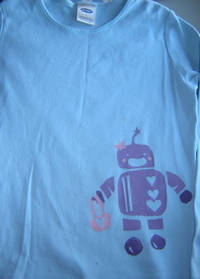 I drew this funky robot, and now I'm thinking I'm going to do a lavender one on a shirt for Princess. In Monkey news... we realized that he can raise one eyebrow. Makes for some interesting faces at dinner! Wish I could capture that on film, but it's not likely. So, Monday means school, going through more winter clothes, post office, and hopefully playing with some friends. I hope you all have lovely Mondays, too!